A little while back, I shared my review of the first book in the series by Ellie Campbell - Looking for Lala (you can read that here) and after a slight delay, here I am with my review of the follow up in the series, To Catch A Creeper. I will be totally honest and admit that I didn't enjoy this book as much as the first, however I did like it a lot. I think the first appeals to me more because of the whole introduction to such important characters as Cathy, Declan and Rosa. When we last left Cathy, she just had found out who Lala truly was and what a shock it was - I had my suspicions for ages but never realised the culprit. The same should be said for this book - the culprit wasn't one of the more obvious choices and I like that about these stories - I hate it when watching a crime drama on TV and you work out the villain within seconds; I prefer going through the clues just like Cathy. Not only does Cathy have to deal with enemies in the workplace in her new high flying job but after her detective work with Lala, she finds herself investigating the Crouch End Creeper. 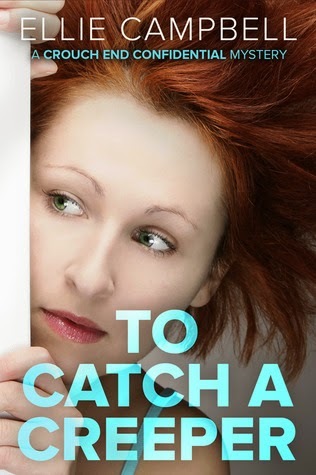 With her friend's husband hiding a secret and fitting the suspect's profile, Cathy knows she needs to find the Creeper before an innocent man could potentially be arrested. Whilst Cathy's attempts to find the Creeper are amusing, my favourite parts were actually when she was at work, trying to find out her saboteur - this time I saw the culprit coming though! Her work scenes, however, were incredibly well written - remember Cathy was portrayed as a naive, downtrodden stay at home mum in the first book so to see her dressed up to the nines for this high profile job was always going to see some slip ups - and Cathy has quite a few. It was funny to read how Cathy is so desperate to fit in that sometimes she really doesn't act like herself. All in all, this is a great read - you are left guessing who the Crouch End Creeper is (believe me, you will be surprised!) and fall just a little bit more in love with Rosa! Well worth a read! This sounds like a good book to read,good review.I must start reading more.